As announced on the NMB along this discussion, I make available step by step my signature archive. First the koto blades, which I arranged to a 696 pages hardcover book in the format 8.25″ wide x 10.75″ tall (thus the same format as I used for my Signatures of Japanese Sword Fittings Artists). 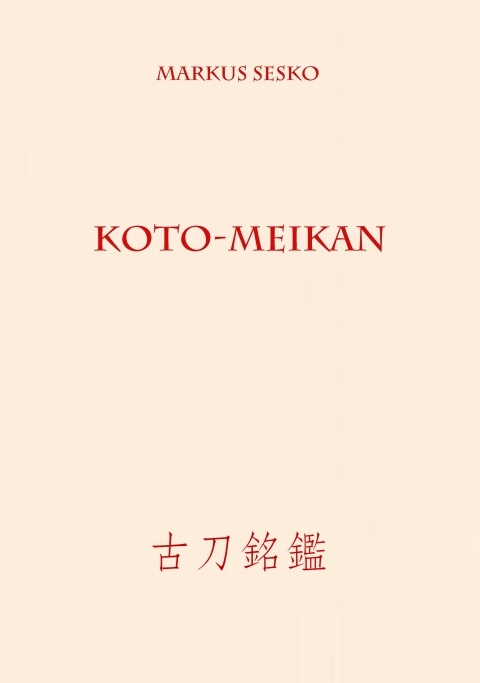 It is a classic meikan format book with pictures of about 2,000 tangs of about 900 koto smiths. A list of all featured smiths can be found as PDF below (the “double-entries” refer to different smiths/generations with the same name). I hope this serves as a reference and also of interest should be the eBook so that one can compare signatures on the spot when going to buy swords. Just like at the previously published Signatures of Japanese Sword Fittings Artists, one can also check a signature to find out if a blade is a promising candidate for papers. The design was kept simple as I don´t like fancy covers, or in other words, a meikan is a meikan and stands for itself. The price is 89.90 USD for the hardcover copy and 39.90 USD for the eBook. A SHINTO-MEIKAN will follow soon. Just a question, what will be the size of nakago oshigata ? Jacques, the size of a katana/tachi-sized nakago is due to the format of the book maximum 19 cm.